Imagine going to the cinema (or whatever it may be called in the future) and all walking into a room with rows of headsets. Everyone takes a headset and the experience begins, walking with the characters as they interact within the narrative, looking around in a 360-experience seeing all aspects. Perhaps the technology becomes so advanced that it is a sensory room, everyone experiences different smells etc. based on where you are in the film and what you are seeing. This is what the future of technology is, completely immersive experiences which take you on a journey like no other. I remember as a kid reading The Lord of the Rings books (as I wasn’t old enough to yet watch the films) and being completely moved by how simply a writer could transport someone into the world they had created. I remember picturing Orcs whilst I read, imagining Gandalf and the Hobbits walking around the shire, sorry for ‘geeking’ out over this film but it has a point, I promise. Then finally came the time when I was able to watch the film, I sat with my parents and it was so much more than I had expected, I dreamt about those films for so long after I had watched it. Films for me will always be the way I connected with the fictional world, where I could escape from the real world and watch a film created solely to entertain. However, technology is advancing at such a rapid rate that soon films may no longer have that same effect and kids instead of reading books and feeling inspired will be lying in bed with VR headsets walking with dinosaurs before they sleep. In 2021 according to International Data Corporation the Virtual and Augmented Reality industry will reach a market size of 215 billion U.S. dollars. Practically every industry is looking to take advantage of the new technology and media in some way. The big players like Facebook and Google have a high awareness and are starting to build the tools that will enable VR to become more pertinent in today’s world. Ted Schilowitz, who is the newly appointed Futurist in Residence at Paramount Pictures is in full support of VR and 360 experiences being the next best thing in the industry, especially film and entertainment more broadly. He says about the impact that this new entertainment will have “I don’t believe that virtual reality and augmented reality are a supplement to our existing media and entertainment landscape. I actually thing that it’s a new form of mainstream entertainment that is yet to truly hit the mainstream”. A lot of experts in the industry are keen to stress that this new development of VR and AR experiences in particular 360° is not trying to overtake the film industry, in fact far from it, they are hoping to combine the great mediums to create an even better immersive experience. However, the progression of this will solely rely on money, a lot of these virtual projects have been very low cost. There is no way that this new medium of human interaction with the virtual can create a truly captivating experience without more money being pushed to content. The growth of this market will be dictated by the quality and quantity of the content coming through, people won’t spend money on the headset if there isn’t amazing content to justify their headset and they need a constant stream of new content to repeatedly put on that headset. However, a recent experiment undertaken by Omnivert suggested that interaction with 360 videos was almost double in terms of VCR (Video Completion Rate). VCR is the ratio of video completions for the number of video starts, this was a 46% improvement over engagement with 2D videos. 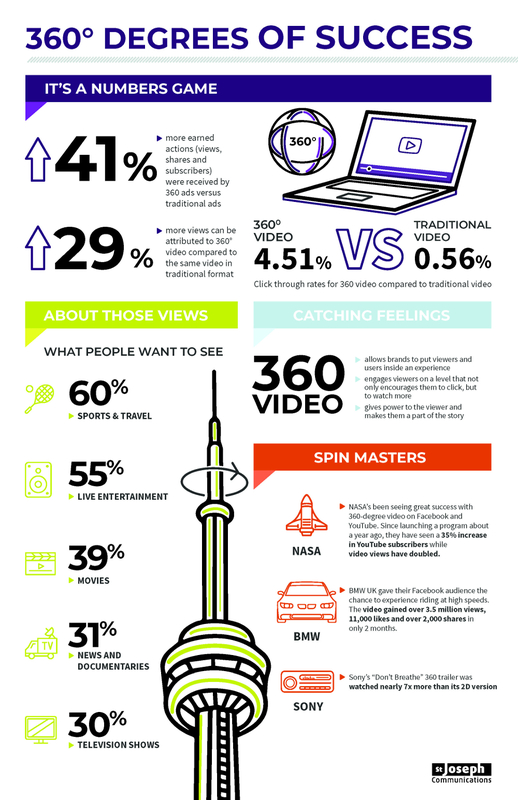 Even though 360° video has not nearly produced enough content, the content that has been released is more engaging. The infographic below suggests this, in all aspects of engagement 360° is more appealing it allows people to really get involved with the narrative and fully experience the concept. 360° film in its current form is not at a high enough standard or nearly been explored enough to suggest whether it is better than traditional film itself. 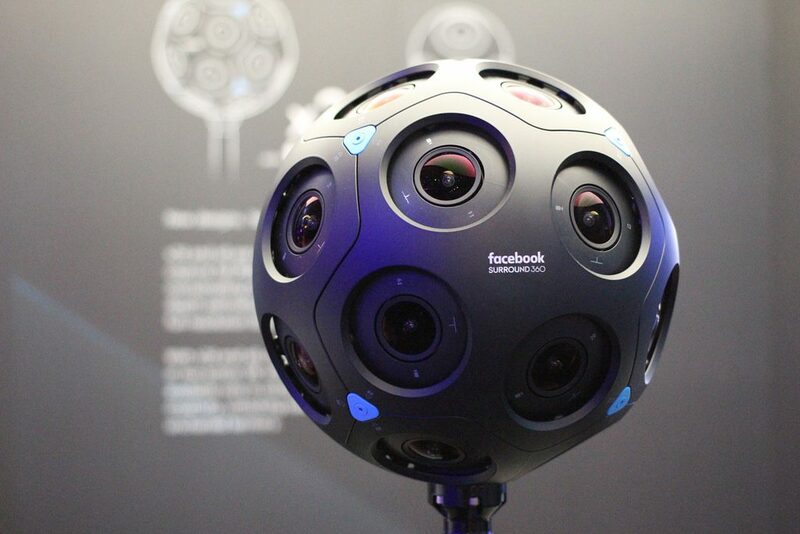 There is however so much that can be done with 360 videos in creating an experience unlike any other. At the current moment there are only a few feature length films which make use of a 360° experience, however some of the best uses of VR and 360-degree video have come from advertising and the like. These include travel advertising, such as the Marriott Hotels use of a 360-degree video stream and booths to create a beach destination complete with heaters and wind jets. Google combined with Columbia sportswear to create a test comparing the engagement of 360 video to standard video. The campaign focused around 2 Olympic skiers, they created two 60 second teasers one that was 360 video and the other being a standard format video. Both ads included CTAs (Call to Action) in the bottom corner that drove to an extended version, this allowed measurement of how well the separate ads were better at driving viewers to a full-length video. The results were mixed, 360° didn’t overperform on traditional viewer metrics however they really motivated people to watch more and interact, in total, the 360 ad drove 41% more earned actions than the standard ad. According to Goldman Sachs, VR will be bigger than TV within the next decade, generating $110 billion in revenue. IDC’s Worldwide Semi-annual Augmented and Virtual Reality Spending Guide predicted that the AR/VR market will grow to over $162 billion by 2020, with active VR users growing to 171 million in 2019. 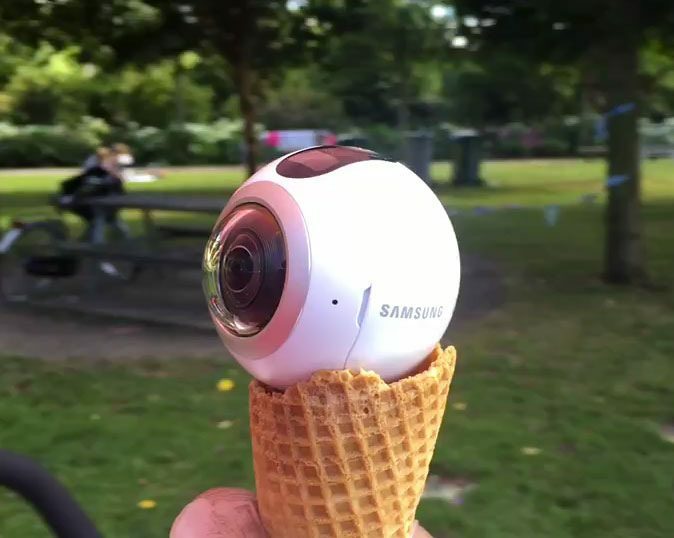 As this experiment showed, 360 video has the potential to drive engagement in promising new ways. The technology encourages viewers to get in on the action by controlling their perspective with a simple tilt of a smartphone or nudge of a mouse. That’s great news for brands, as the novelty of that viewing experience not only makes people want to watch 360 videos, it also makes them want to share. As the technology continues to develop and more brands experiment with the format, its value will likely become stronger—for viewers and brands alike. This with regard to film, is similar, even the use of this technology is such a positive advancement and will grow rapidly as people begin to familiarise themselves with the endless possibilities this immersive experience can introduce. Film has the ability to evoke this sense of engagement but at the moment the volume and quality of content just isn’t what it needs to be.